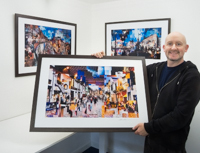 I've always believed that my images are best viewed on a large scale, so for a limited time I'm cutting the prices quite substantially of my 'large' range from £245 to £175 to make sure more of my work gets seen in a size that does it justice! All of my collages are available in the 'large' size. 36x24" for regular shaped images or 38x18" for panoramic shaped images. I've recently created an account for my collage work on Instagram. 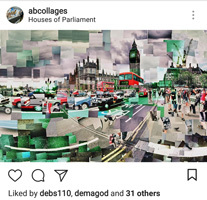 So just follow 'ABcollages' if you'd like to see the occasional piece of my work pop up on your feed. Plus perhaps some behind the scenes snaps of new works in progress too! For too long I hadn't completed a collage from my home town Glasgow, but I'm proud to now be able to show this new image of the much loved bar 'Sloans'. This collage was a personal comission by a couple who were recenty married at this venue as a present to each other. In initial discussions I didn't actually believe it would work as a collage due to the scene being very narrow, but I am now glad that I overlooked my hasty initial reaction and worked through the tricky aspects of making this into what I feel has become a visually sucesfull image. Ironically it is now quite possibly one of my favourite Glasgow images! The original has been sold, but prints of all sizes are available. One of the most iconic spots in Manhattan trully could not be missed out, so here is my recently completed collage of Grand Central Station. With all the component photographs captured over one day during my hectic New York visit schedule it feels even more of a specific slice of captured time than usual. Standing back and exploring this image again on completion takes me right back to being overwhelmed by being in both such a famous building, and one which is used purely functionally by thousands daily. Also being reminded of my girlfriend Trace curiously exploring the area, and the surprise of am impromtu ballerina performance under a shaft of light contine to remind how special a place this is. Prints and the original image are both available. This collage was shot on the spur of the moment whilst at a gig in Brooklyn, New York. Luckily I had my camera with me so this insane little slice of an authentic Wiliamsburg afternoon could be captured in 360 degrees throughout the show as deserved. The outdoor venue is the quirky and popular bar 'Union Pool', set in a former pool supply store with a handy taco truck parked in the backyard! The infamous Har Mar Superstar played a storming set, which in his usual style involved him climbing over the stage, taco truck, and dancing with fans in a dissused pool. Not my typical cityscape subject of course, but I'm loving how it turned out, and plan on getting in the thick of more scenes like this. Well, maybe not quite like this, not much is like a Har Mar show, but you know what I mean! This image was completed for a private commission, and captures an authentic slice of upper Manhattan life, taking in the likes of Amsterdam Avenue, the 72nd Street Subway, and the renowned Gray's Papaya on the corner of 72nd and Broadway. The Original may be now on display in the USA, but all print options are available. This is the first in a series of New York collages, so keep a look out for more soon! Drop me an email to be added to my 100% spam free mailing list. At last after many years of requests I have completed an Edinburgh collage! This is based on the well loved Victoria Street, just around the corner from the famous Grassmarket. A PDF of the magazine feature documenting the creation of this image is also available by clicking either of the images below. The original image and prints in all presentations are available of this image. My most recent featured collage in Completely London magazine is this piece capturing London and its typically contrasting architecture living in close quarters. This image was shot from (and also incorporates aspects of) the 'One New Change' office and retail development, and is significantly different from the sunset collage image I produced a number of years ago from a nearby location. One of my most exciting projects was in connection with Lonely Planet where they commissioned new collages to promote their guides. This involved me visting four cities and creating a collage of each. The images of Paris, London, San Francisco and Singapore can be seen below. Images appearered in both the press and Billboards in the London Underground; and more recently the original images along with many others were on show in a solo exhibition in London's West End. to thank everyone who attended and made it possible. During the San Francisco leg of the Lonely Planet commission, Al from Creative Cherry came along to make a short film about my work and the process involved. Recently I was asked to appear on STV's prime time chat show 'The Hour' and talk about my collages. My latest contribution to Completely London Magazine is this image of Wimbledon Stadium. Captured over two nights 'at the races'. This image illustrates the ever popular East London venue. The Completely London 'Play' issue is out now, and prints are also available of this image. Recently Completely London Magazine won 'Best Use of Photography' award for the 'Love issue'. The image submitted to Association of Publishing Agencies was my 'Eros' image of Piccadilly Circus. The image can be seen through the link below and the listings on the link to the right. The latest is based around the Eros Statue in Piccadilly Circus. This well loved spot in the heart of London's West End was recently captured over a week of picturesque rainy evenings mainly around dusk time. This one has quickly become a new favourite of mine! The Kyoto Garden in Holland Park. A quite unusually peaceful subject matter compared to my cityscapes. Nevertheless this collage was a rewarding challenge which I feel worked very well. The reception from readers also was positive, and you may just have time to pick up a copy before the next issue comes out! Original collages and prints of all sizes are available for both these new images. Recently I have embarked on a new regular venture working with Kinleigh Folkard & Hayward on their exciting new magazine Completely London. In each issue one of my collages will be showcased over a double page spread in this beautifully crafted publication. Issue one features my Camden image. Over the past week I was shooting for a new collage that is to be used in the Spring edition. I'm not at liberty to discuss the subject matter yet, but suffice to say that although it will compliment my previous work it is still quite a considerable departure! Earlier this year I had the pleasure of exploring the captivating Swiss city of Zürich for a commission. So far I have completed two images. The first being of Paradeplatz and the second of the main station, Zürich Hauptbahnhof, (or Zürich HB as it's more commonly known!). Both of these originals images now reside in only a short tram ride from where they were shot, but prints of all sizes and formats are of course available. An automotive collage is something which I had been keen to do for some time. So when Sitech Racing commissioned me to illustrate their 400BHP RS Turbo demo car in my collage style I was more than happy to get to work! This image is made from various runs with the car and is intended to convey the nature of typical late night testing sessions it often sees. I've been looking for a suitable print outlet in London for quite some time and at last I finally found the right one! 'The Only Place for Pictures' is a long established gallery/gift shop in Islington selling a range of artwork complimentary to my own style. A full range of prints ranging from £25 to £300 is available. The shop boasts long opening hours, a wide range of quality stock, friendly staff, and there's even a discount scheme on offer too! Recently I was commissioned to go to the south of Spain and capture the stunning Cadiz Cathedral. The largely baroque-style cathedral was built over a period of 116 years, and, due to this drawn-out period of construction, the cathedral underwent several major changes to its original design. This resulted in it finally being completed in a neoclassical style. Well, the opening night went down a storm! We estimate that around 150 people visited between 7 and 10pm! A big thanks to everyone who came then and throughout the two week run. 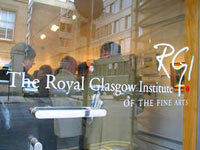 Recently there was a double page feature about myself and the RGI exhibition in the Evening Times. Thanks to writer Ross McKinnon.